Salmon typically live the majority of their lives in saltwater oceans, and North American salmon typically live in the Pacific Northwest. 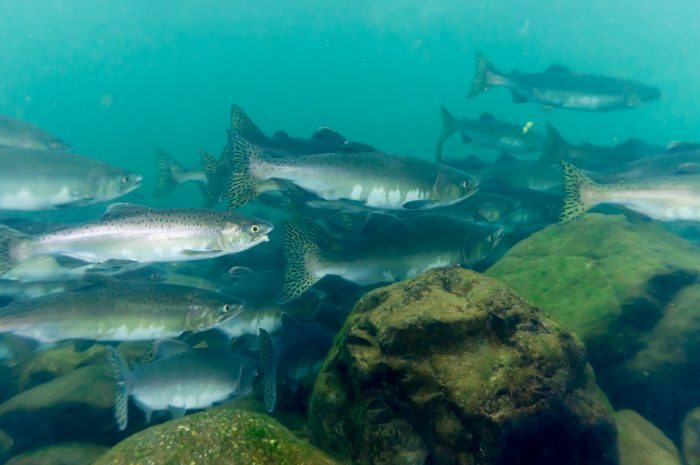 However, they travel to freshwater to lay their eggs, resulting in young salmon beginning their lives in freshwater before traveling back out to saltwater oceans and seas. A large number of North American salmon inhabit the North Pacific Ocean and the Bering Sea. Salmon are capable of traveling thousands of miles during their lifetime, and they can survive well in freshwater or saltwater. Salmon travel back to freshwater to lay eggs, specifically in the location that they were hatched themselves.